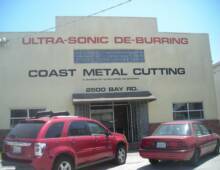 Coast Metal Cutting and Ultra-Sonic De-Burring are divisions of Ultra-Sonic De-Burring of Northern California, Inc.
COAST METAL CUTTING IS “A CUT ABOVE". Our proprietary "ultra-sonic" process allows the removal of microscopic burrs from miniature to sub-miniature parts. With three ultra-sonic vibratory units and 23 rotary tumblers, we are equipped to handle all your needs from rough deburring to expert finish of the most critical parts. With ultra-sonic de-burring you’re sure to get “a fine finish”. Together, COAST METAL CUTTING and ultra-sonic de-burring is totally self-sufficient. Our complete machine shop and material handling facility, allow us to manage all our own tooling needs and your job smoothly. Our expertise in manufacturing engineering lets us define the most effective and economical precision metal cutting, machining and finishing processes for your application. Bar or thicker-wall tubing to 3.5"
Copyright 2010: Coast Metal | Deburring. All Rights Reserved.